You are currently browsing the tag archive for the ‘South Jersey’ tag. Often while working on the daily pieces for NaPoWriMo, I am reminded of my experience of writing poetry in the Stone Age before the internet explosion. I would write a piece and many times it would feel like the page would burn my hands if I didn’t do something with it. Off to Kinko’s I’d go so I could make copies for poet friends or to send it off to the most suitable Call for Submissions. I would feel a kind of relief then, as if this urgent burst of energy now had some focus or reason to be. The immediacy of my daily posts on the Facebook Fan Page and 365/365 more than fulfills that old urge, and is fairly confronting. I am taken aback at just how truly immediately other eyes are on these words. The commitment to write daily leaves no real time for revision, rethinking, retraction. I get to see my jagged edges, neuroses, loves, and incomplete thoughts. And so does everyone else. Really quickly. The swiftness of sharing this ongoing series of poems and the comments and conversations that come up around them is as soul-shaping as the writing. I do feel shaped by what I write, as the inner and outer experiences shape me and prompt me to write. 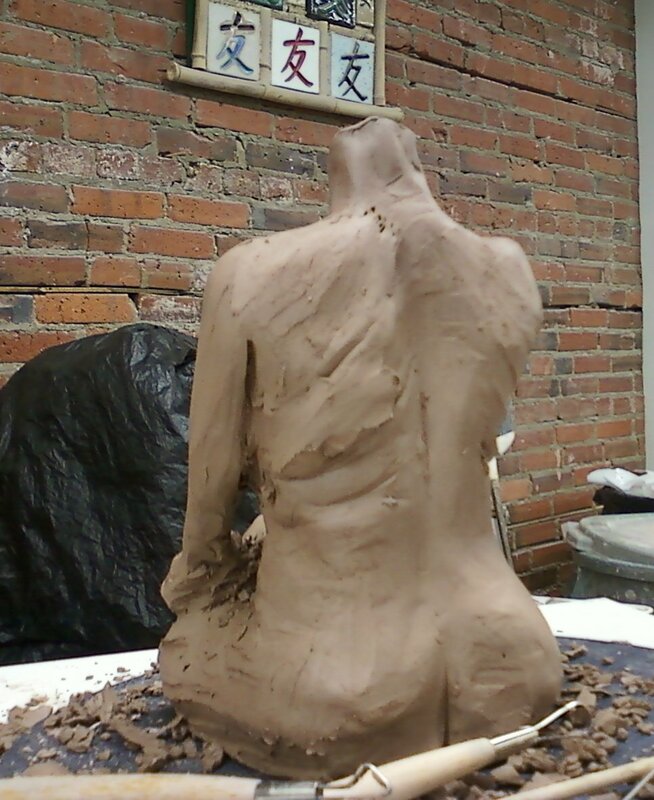 I have felt shaped quite literally lately, posing for a clay sculpture class. It is odd to feel sometimes like there are 10 voodoo dolls of me being molded before my eyes. I sometimes imagine that I’ll leave class subtly or profoundly different from the way I came in, and wonder about this as a metaphor for every interaction. in my personal deck of Tarot. The role of The Devil has been taken. when I can’t hear Her over the music. Where the forest holds love without need. if there must be fire. an otherwise perfect spring fever. to feel cute on South St.
the inevitable end to cold. This train best get going. and me with knives in mine. Luck held out for both of us. but I will not rush this season. drops of blood to a ravenous bat. I turn my head to breathe. The box is open now. forged with sparks of light. your poisonous script will run. smooth in the rhythm of my streets. May tell the stories better than I.
I caved. She’s first again.